The health benefits of pistachios for diabetes include better blood sugar management thanks to a low glycemic index and load score and a good magnesium content, cholesterol-lowering properties and benefits for diabetes-associated hypertension and nerve damage, including optic nerve damage causing loss of vision. Pistachios additionally provide minor benefits for skin and wound healing as well as help regulate digestion, provide satiation and up energy levels, supporting an active lifestyle and weight loss. The only condition is that they be consumed in modest amounts, according to the diabetic patient’s individual nutritional requirements and the restrictions of their condition. Because, despite their many benefits for diabetes, pistachios remain an important source of fat and calories and can encourage weight gain if consumed in too large amounts, too often. For most people, a healthy serving of nuts equals 1 oz, or 28.35 grams or 1/4 of 100 g. For pistachios, one serving would amount to 49 kernels (no shells). No more than 1-2 servings a day is enough if you want to enjoy the benefits pistachios have to offer, without experiencing side effects from the too high fat and calorie content. The glycemic index (GI) measures how fast the carbohydrates in a food raise blood sugar. Below 55 is a low GI. Between 55-69 is a moderate GI. Between 70-100 is a high GI. The glycemic load (GL) measures how fast the carbohydrates in a serving of food raise blood sugar. Below 10 is a low GL. Between 11-19 is a moderate GL. Over 20 is a high GL. Due to their high fat and protein content, nuts and seeds generally have low glycemic index and load values, around 20-30. What this means is that, eating pistachios or other nuts will likely have minimal effects on blood sugar, which is good for diabetes. The glycemic index of pistachios is low, well below 55, and estimates put it around 20, similar to cashews. The glycemic load of pistachios is also low, below 10, and estimates put it around 5. In the case of the glycemic load, the lower the intake (the smaller the serving size), the lower the GL score. 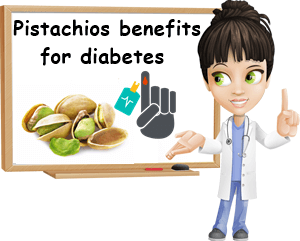 One of the main benefits of pistachios for diabetes is the fact that they can lower the effects on blood sugar of other, higher glycemic foods. Pistachios are a low-glycemic food (low GI and GL scores) which means they have minimal effects on blood sugar. When you eat them with other foods that are higher on the glycemic index and load scales, pistachios can lower the glycemic effects of those other foods too, making them slightly more diabetes-friendly. Of course, this doesn’t mean you can load up on sweets or carbs if you’re diabetic, just because you are eating pistachios. But it means you can enjoy a piece of fruit such as a banana or a serving of cantaloupe (both of which are higher-glycemic foods) and experience a lesser rise in blood sugar, if you pair the piece of fruit with some pistachios (or other nuts). Magnesium is a sort of jack-of-all-trades when it comes to the biological functions is fulfills. One of the biggest benefit of magnesium for diabetes is that it helps with blood sugar management, hence the need to get enough of it if you’re diabetic. The average adult requires around 400-420 mg of magnesium a day to avoid a deficiency. Pistachios provide 121 mg of magnesium per 100 g, 149 mg per cup (123 g a cup) and 34 mg per oz. Having just one 1 oz serving provides you with around 8.5% of your entire daily requirements of the mineral to help you better manage your blood sugar. Pistachios naturally have almost no sodium (1 mg for 100 g) which is good because it means they don’t raise blood pressure. Even better, they are good sources of magnesium and especially potassium, the two key nutrients for blood pressure management. Getting enough of these two nutrients in your daily diet means that you can get your blood pressure to lower naturally and enjoy better cardiovascular health, especially with diabetes. The average adult requires about 4700 mg (4.7 g) of potassium a day to prevent a deficiency and associated side effects. Pistachios provide 1025 mg of the mineral per 100 g, 1261 mg per cup (at 123 g a cup) and 291 mg per oz. Having just 1 one oz serving provides you with 5.5% of you daily requirements of potassium. And while it may not seem like very much, consider the fact that potassium deficiency is one of the most common nutrient deficiencies among adults worldwide. Not to mention a leading cause of hypertension and associated side effect such as stroke and other cardiovascular events. Any food source that can up intake is welcomed if you want to enjoy good blood pressure numbers. One of the reasons why pistachios are good for you if you have diabetes is because of their beneficial effects on cholesterol. First of all, despite being rich in fat, they are a lot higher in healthy, unsaturated fats than saturated fat. This ratio alone contributes to lower LDL (bad) cholesterol and higher HDL (good cholesterol). 100 g of pistachios provide almost 6 g of saturated fat, but over 23 g of monounsaturated fatty acids and over 14 g of polyunsaturated fats. A 1-oz serving (49 kernels) provides almost 1.7 g of saturated fat, but 6.6 g of monounsaturated fatty acids and 4 g of polyunsaturated fatty acids. Secondly, they are high in dietary fiber, indigestible plant material that contributes to reducing fat and cholesterol absorption at the intestinal level, indirectly contributing to healthier cholesterol levels and profile. Lastly, pistachios are an important source of multiple micro-nutrients with benefits for cardiovascular health. For example, vitamin E helps prevent fat oxidation and contributes to artery health, while vitamin B3 raises HDL (good) cholesterol levels as well as combats arrhythmia in its various forms. Over time, high blood sugar levels cause organ, tissue and nerve damage. Nerves all over the body are affected in diabetes, including the optic nerve which ultimately causes loss of vision. Managing blood sugar levels through diet, exercise and medication as well as enjoying good nutrition are the solutions to preventing, controlling and sometimes even reversing diabetes and associated health issues, such as nerve damage. When it comes to pistachios and diabetes associated nerve damage, certain micro-nutrients stand out. For instance, vitamin B1 directly contributes to the health of the optic nerve and can help with diabetes-associated loss of vision. Pistachios provide 0.87 mg per 100 g, amounting to around 75% of the daily recommended intake, RDI of vitamin B1 for the average adult. As little as 1 oz provides about 18.75% of the RDI, which is a lot. Then there are vitamins B6 and B9 which are shown to actively lower the risk of macular degeneration, or loss of central vision. Risk factors include hypertension, high cholesterol, obesity, all common in diabetes. 100 g of pistachios provide 1.7 mg of vitamin B6 and 51 mcg of vitamin B9, 130% and 13% of the RDI for an average adult. As little as 1 oz can provide 32.5% RDI of vitamin B6 and 3.25% RDI of vitamin B9. Lastly, antioxidant carotenoids such as lutein and zeaxanthin further contribute to healthy eyes and good vision. – Benefits for skin and possibly also wound healing from vitamins C and E, B vitamins, antioxidant carotenoids such as alpha and beta-carotene and zinc. – Minor weight loss benefits from good fiber, fat and protein content. Fiber satiates and keeps you full for longer. Fat and protein provide lasting energy, curbing hunger. – Energy-boosting effects from generous iron and B vitamins content – supportive of an active lifestyle. – Lower type 2 diabetes risks from regular, but moderate nut consumption.